$1,200.00 Order of the Saur (April) Revolution, Type 1, #0653, 1978-79. In silver gilt and enamels, a massive and very impressive piece manufactured by the Soviet mint. The extremely rare early version was awarded less than 130 times by the Khalq regime prior to the Soviet takeover of Afghanistan. In outstanding condition. $1,100.00 Order of the Star, 1st class, Type 1, 1980-1987. Extremely rare first version of the order, made prior to the 1987 change to the state emblem. In excellent condition and includes original ribbon. $950.00 Order of the Star, 1st cl., Type 2, 1987-1992. Second version of this order, made after the 1987 change to the Afghan state emblem and issued until the fall of the communist regime in 1992. In near mint condition and includes correct ribbon. $230.00 Order of the Star, 2nd cl., Type 2, 1987-1992. Excellent condition. Comes with correct ribbon. $180.00 Order of the Star, 3rd Class, Type 1, 1980-1987. In excellent condition. $650.00 Order of the Red Banner, 1980-1992 issue. A very scarce numbered issue in excellent condition. Most were awarded to high ranking Afghan and Soviet military officers. $325.00 Order of Friendship of Nations, "Ring Reverse" variation, 1980-1992 .In very fine to excellent condition, showing modest wear but no major flaws. Includes original suspension and ribbon. $390.00 Afghanistan, Order of Friendship of Nations, "Flat Reverse" variation, 1980- 1992. In excellent condition. $450.00 Order of Ghazi Amir Amanullah, circa 1980s. In excellent condition. $340.00 Order of Sayed Jamalludin Afghani, circa 1980s. In excellent condition, with original ribbon included. $120.00 Afghan Medal for Valor, 1980s. Superb example with perfectly preserve silver finish and original ribbon included. $125.00 Medal for Excellent Military Service, 1980-1992. In outstanding condition. $130.00 Medal for Good Service, 1980-1992. Similar in design to Soviet Medal for Combat Service (aka Medal for Military Merit). In near mint condition, literally impossible to upgrade. Includes scarce original ribbon. 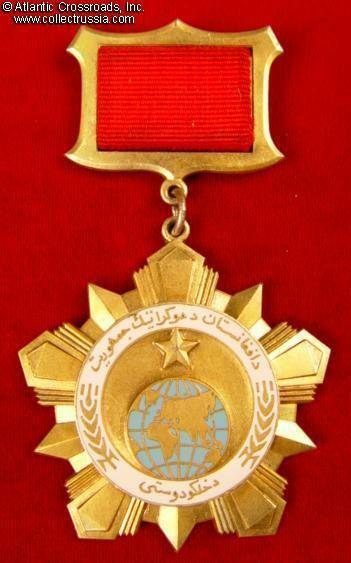 $130.00 Medal for 25 Years of Service in the Afghan People's Army, 1987-1992. A very fine to excellent example with perfect enamel and nicely preserved gilt. Comes with scarce original ribbon. $40.00 Medal for Service in the Armed Forces of Afghanistan, 2nd cl. (for 15 Years of Service), 1987-1992. In excellent condition. $45.00 Medal for Service in the Armed Forces, 3rd cl. (for 10 Years of Service), 1987-1992. $25.00 Medal for Service in the Armed Forces, 4th cl. (for 5 Years of Service), 1987-1992. $295.00 Medal for Selflessness (aka "Self-Sufficiency Medal"), 1982- 1992. In Outstanding, near mint condition. Comes with very scarce original ribbon. $110.00 Medal for Faithfulness, 1982-1992. German silver, copper plating. Nice, typically Soviet artwork in high relief. $25.00 Medal for 10th Anniversary of Socialist Afghanistan, 1988. $25.00 Medal for 70th Anniversary of Restoring Independence of Afghanistan, 1989. Excellent condition. $70.00 Medal for Literacy, 1st cl., circa 1980s through 1992. In excellent condition. Comes with a generic ribbon. $50.00 Afghan Medal for Literacy, 2nd cl., circa mid-1980s- 1992. In very fine condition. $175.00 Masjidi Khan Medal, circa 1980s. In excellent condition and includes perfectly preserved, clean original ribbon. $125.00 Muhammad Akbar Khan Medal, circa 1980s through 2000s. In excellent condition. $95.00 Muhammad Ayub Khan Medal, circa 1980s. In outstanding condition, with the original fire gilt completely intact. Includes scarce original ribbon. $160.00 Mullah Mushke-Alam Medal, circa late 1980s -1992. In excellent condition and includes original old ribbon. $130.00 Communist Afghanistan Army officer hat badge, "OVERSIZED" 75 mm version, 1980-87. In excellent condition. Very rare.